The Avast Support Tool is a diagnostic tool that checks your Avast Antivirus software for common problems and offers troubleshooting solutions. It can also gather files to send to Avast as a reference for Avast Support representatives and engineers. 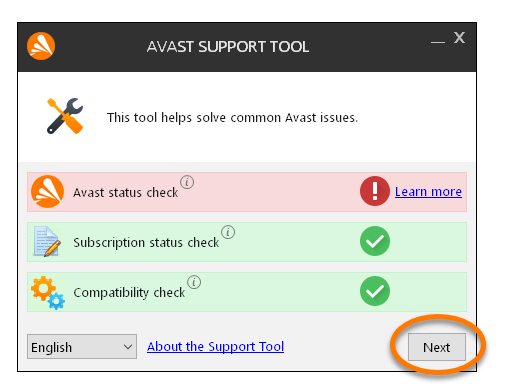 Avast Support does not automatically check for newly submitted support files so before you send a support file via the Avast Support Tool, please notify Avast Support via the support portal. 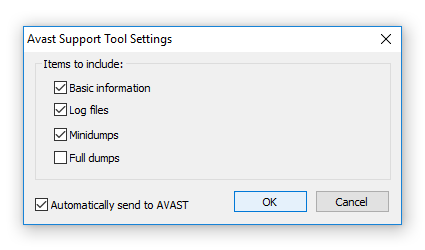 Right-click the downloaded avastsupport.exe tool icon and select Run as administrator from the context menu. If prompted by the User Account Control dialog for permissions, click Yes (or Continue). 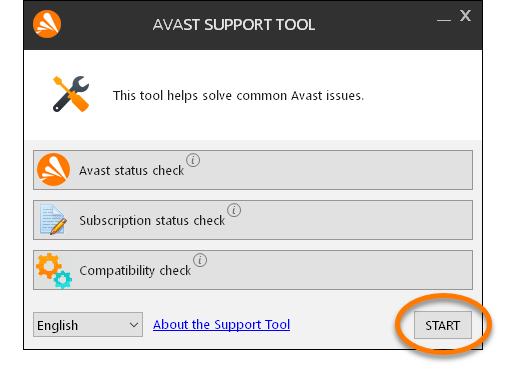 If the Avast Support Tool does not run automatically, then click Start. Hover your cursor over the information icon to find out what each check does. Ensure you are connected to the internet, then follow the instructions above to run the Avast Support Tool. When the Avast Support Tool has finished running, click Next to create a support file. Click the Learn more link to view help and suggestions for an issue. 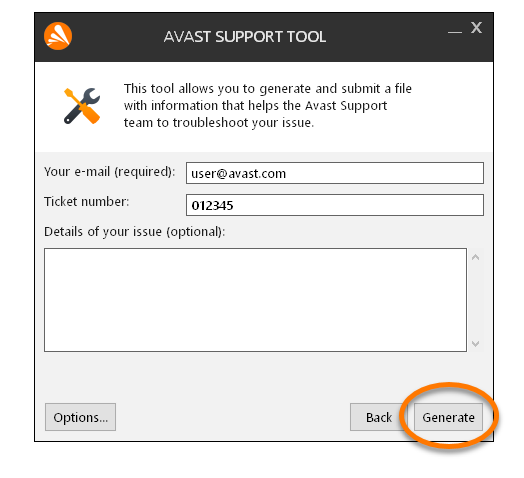 The e-mail address you provided when you contacted Avast Support by submitting a ticket via the support portal. The Ticket ID you received after submitting the ticket. By default, support files are sent to Avast servers. You can change this setting by clicking Options. Click Generate to allow the tool to gather the necessary files. This process may take several minutes. The support file is automatically sent to Avast Support if you are connected to the internet. For future reference, note the File ID and its location on your PC. 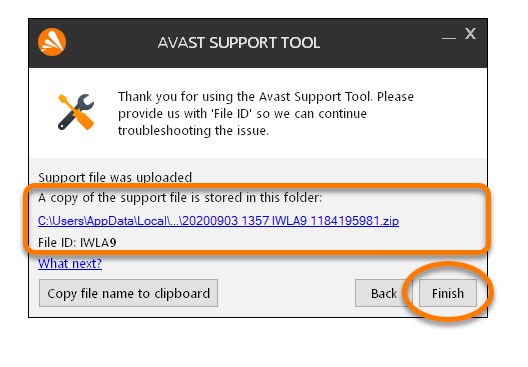 In your next communication with Avast Support, you can provide the support File ID to our support representatives. 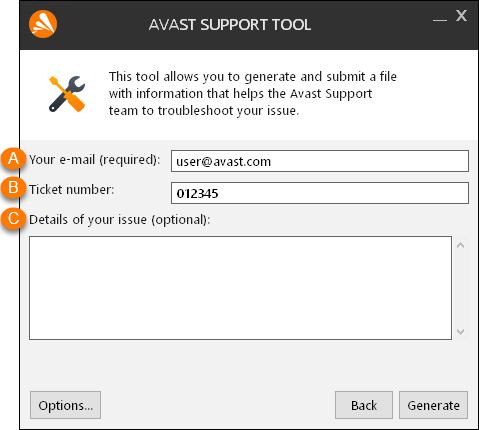 Click Finish to complete the file submission to Avast Support.